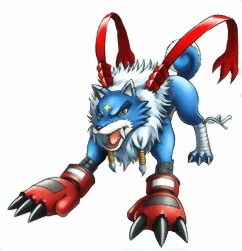 A Beast type Digimon from which the claws that Gaomon possessed grew bigger, whilst the boxing gloves the claws were being protected with matured as well. 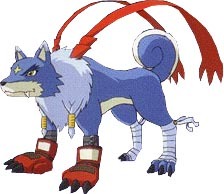 He moves on four legs, which are tough enough for him to attack enemies whilst standing up bear-like on the spot. 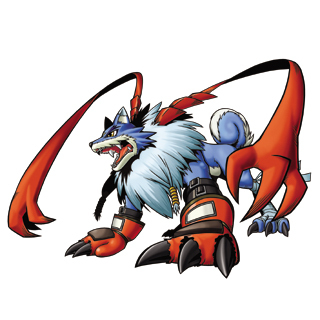 His special attacks are "Gaoga Hound", where he clamps onto the opponent with his tough teeth and doesn't let go until the enemy drops down dead, and "Dash Double Claw", where he charges towards the enemy at blinding speed and slashes it with his claws. In addition, his "Spiral Blow" attack allows him to emit strong whirlwind-shaped blades from his mouth at a stretch. Origin / Japanese. Gao is the sound of barking. Ga is short for garuru, which is the sound of a growl. Origin / Japanese. Gao is the sound of barking. Ga is short for garuru, which is the sound of a growl.